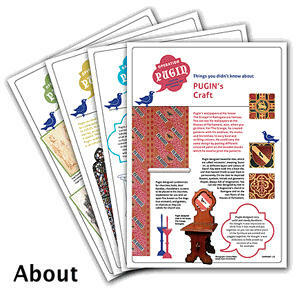 Operation Pugin is the name given to a series of educational creative workshops for schools, suitable for Key Stages Two and Three, and based on and around the work of Augustus Pugin. Operation Pugin was devised as part of a grant given to the Pugin Society by the Heritage Lottery Fund in 2012 to celebrate Pugin’s Bicentenary, and with the aim of making Pugin better known to children in the Thanet/East Kent area. We hope, though, that this project may be able to find wider use also, since it can now be downloaded on this site, and that those who access it will find it inspiring. Operation Pugin looks at four aspects of Pugin's life, colour-coded by topic. Each selection has an ABOUT section and two ACTIVITY sheets related to that topic, as well as templates for design projects. Adobe Acrobat is required to view these resources. Download it for free HERE. We encourage you to start by looking at the TIMELINE OF AUGUSTUS PUGIN'S LIFE and the collection of PUGIN IMAGES. Pugin was born on March 1st 1812 so why not hold your own Pugin Birthday Party? measuring, using rulers, protractors, set squares, graph paper etc. explained and some examples shown. Books may be passed round for students to look at. project will develop crafting and design skills, colour theory and pattern making. life, and relates to the idea of keeping a journal/diary/sketchbook. Pugin was living in Ramsgate, he owned a boat and would rescue sailors when they were in danger.